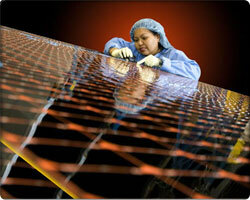 Spectrolab – a subsidiary of US giant Boeing – has set a new world record for terrestrial solar cell efficiency at 40.7%. Using similar technology to that used in space-based solar cells (multi-junction solar cells), these new photovoltaic (PV) cells convert concentrated sunlight into electricity better than any previous cells. Solar panels made from these cells will achieve higher power output per surface area and use up less raw materials during manufacture than existing PV solar panels. These cells offer almost double the efficiency of SunPower’s soon to be released SPR-315 Solar Panels which rate an already impressive 22+% efficiency, far better than the 12-18% industry average. The latest multi-junction solar cell technology has been used in these cells which enables more of the solar spectrum to be captured than is the case with conventional silicon solar cells. Each multi-junction solar cell is made of layers with each layer designed to capture one range of wavelengths of sunlight. This increases the number of photons whose band gaps are matched and so more sunlight is absorbed and converted into electric current increasing overall efficiency. For example, if silicon is alloyed with carbon in a layer, the band gap increases and more blue light is absorbed. Conversely, if silicon is alloyed with germanium in another layer, the band gap is decreased and more red light is absorbed. These new solar cells also use an optical concentrator to increase the intensity of the sunlight hitting each solar cell. 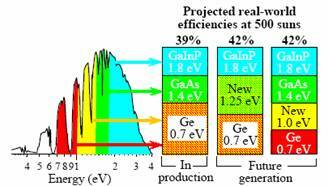 More photons of light equals more electricity generated and so efficiency is further increased. The US Department of Energy believe that solar cells with such high efficiencies will eventually lead to installation costs of just $3 per watt and generate electricity at a competitive 8-10 cents per kWh. Spectrolab scientists believe that these multi-junction solar cells are capable of even higher efficiencies in the near future.